The SPDC's continued efforts to remove all traces of resistance from the hills of Toungoo District have resulted in a wide range of human rights abuses. In order to gain complete control over the region, the SPDC is continuing with its road construction projects, increasing its military presence and establishing more Army camps across the district. There are now few areas which SPDC Army columns cannot reach. Villagers living under SPDC control are constantly called upon to construct and maintain these roads and to porter supplies and munitions along them to outlying SPDC Army camps. The relentless demands for forced labour, materials, food, and money have resulted in severe food shortages. Many villagers in the district have chosen to live internally displaced hiding in the forest rather than live under the SPDC. Several thousand villagers are now living in hiding. Large numbers of landmines continue to be sown throughout the district, posing a very real threat which will remain in place for years to come. This report describes the current situation faced by rural Karen villagers in Toungoo District (known as Taw Oo in Karen). Toungoo District is the northernmost district of Karen State, sharing borders with Karenni (Kayah) State to the east, Pegu (Bago) Division to the west, and Shan State to the north. To the south Toungoo District shares borders with the Karen districts of Nyaunglebin (Kler Lweh Htoo) and Papun (Mutraw). The westernmost portion of the district bordering Pegu Division consists of the plains of the Sittaung River, which are heavily controlled by the State Peace and Development Council (SPDC) military junta which presently rules Bu rma. The rest of the district to the east is covered by steep and forested hills that are home to Karen villagers who live in small villages strewn across the hills. For years, the SPDC has endeavoured to extend its control through the hills, but their efforts thus far have been hampered by the continued armed resistance of the Karen National Liberation Army (KNLA). Within the areas that are strongly controlled by the SPDC, the villagers must live with constant demands for forced labour, food, and money from the SPDC battalions that are based in the area. Villages that do not comply with SPDC demands risk being relocated and burned. Many villages have been burned and their inhabitants forcibly relocated to sites where the SPDC may more easily control and exploit them. Those villagers who do not move to the relocation sites flee into the jungles where they live as internally displaced persons (IDPs). Several thousand villagers now live internally displaced in the mountains of Toungoo District. These villagers live in almost constant fear of SPDC Army units, and must run for their lives if they receive word that a column of soldiers is approaching. SPDC Army columns routinely shoot displaced villagers on sight. The villagers here continue to suffer severe human rights violations at the hands of the SPDC Army soldiers, including, but not limited to summary arrest, torture, forced labour, extortion, extrajudicial execution, and the systematic destruction of crops and food supplies. Although a verbal ceasefire is in place between the Karen National Union (KNU) and the SPDC, not much has changed for the villagers in the district. KNLA and SPDC military units still occasionally clash. The SPDC has taken advantage of the ceasefire to move more troops into the area and to build new camps. These new camps and troops have meant that the villagers now have to do forced labour building the new camps and portering supplies up to the camps. There are also more troops and camps to demand food and money from the villagers. The many new camps have made it more difficult for internally displaced villagers work their fields or to go to find food. This report is based on numerous field reports and a total of 329 separate interviews gathered between October 2000 and July 2004, of which 197 have been directly quoted throughout this report. The direct testimony of villagers living within Toungoo District has been supplemented in the report by interviews with Karen relief workers who have first-hand knowledge of the region. KHRG field researchers conducted interviews with villagers living within the SPDC-controlled areas, relocation sites, hill villages, and also with IDPs living in hiding in the jungles. These testimonies are supported by additional evidence in the form of photographs and SPDC order documents issued to villages, incident reports, maps, and field reports compiled by KHRG field researchers. Over 1,500 pages of testimony were recorded and reviewed for this analysis of the present situation in Toungoo District. This report has been divided into several parts for ease of reading and clarification; it begins with this Preface and is then followed by an Introduction and Executive Summary . The analysis is then broken down into topics under the main sections of The Military Situation , 'Nyein Chan Yay' Villages , 'Ywa Bone' Villages , Landmines , Food Security , and the Future of the Area . Within these sections the villagers tell much of the story through direct quotes from their testimonies. At the end of the report are several appendices: a list of the 197 interviewees whose testimonies are quoted throughout this report, a list of SPDC Army units operating in Toungoo District from 2000 to 2004, additional English-language translations of SPDC order documents issued to villages in Toungoo District not included in the body of the report, and finally censored copies of the original Burmese-language SPDC order documents that have been reproduced throughout this report. The full text of the interviews and field reports, upon which this report is based is available as a separately published Annex which is available from KHRG upon approved request. In this report, all names of those interviewed have been changed and some details may have been omitted where necessary to protect people from retaliation. Pseudonyms are shown in double quotes; all other names throughout this report are real. The captions following each quotation in this report include the interviewee's (changed) name, gender, age, village and township, and a reference to the interview or field report from which the quote was taken. These reference numbers may be used to find the full text of the interview or field report in the interview annex. The text often refers to villages, village tracts, and townships. The SPDC has local administration called Peace and Development Councils, at the village, village tract, township, and state/division levels. A village tract is a group of 5-25 villages centered on a large village; for example, Kler Lah village tract. A township is a much larger area administered from a central town. The Karen National Union (KNU) divides Toungoo District into two townships: Than Daung in the north, and Tantabin in the south. The official SPDC village tracts and townships do not correspond to the Karen village tracts and townships; for example, under the SPDC system, all of Toungoo District is essentially comprised of only one township, known as Than Daung township. Throughout this report, the village tracts and townships as defined by the Karen have been used as these are the ones referred to by the villagers. In Toungoo District, most villages and towns have both a Karen and a Burmese name, and both appear throughout this report depending on which are used by the villagers. Some examples are shown below. In this report, Than Daung Gyi is used to distinguish it (the Than Daung found on most maps) from New Than Daung (a.k.a. Than Daung Myothit), which is where the township offices are located. In the interviews, the villagers will often refer to 'loh ah pay'; which is literally the traditional Burmese form of voluntary labour performed for the community. The SPDC uses this term in most cases of forced labour, and has become known to the villagers to refer to most forms of forced labour with the exception of long-term portering. Villagers now say that even this form of portering is called 'loh ah pay' by the SPDC. 'Set tha' means forced labour as messengers at SPDC Army camps. Other Karen, Burmese, and Pali terms may be found in the list of 'Terms and Abbreviations' which follows. Villagers often refer to the KNU/KNLA as 'Kaw Thoo Lei' (the name of the Karen homeland), and SPDC troops and officials as 'the Burmese' or 'the enemy' (the latter being a habit that they have picked up from the local KNLA). SPDC officers often accuse villagers of being 'Nga Pway' ('ringworm'); this is derogatory SPDC slang for KNLA soldiers. Villagers in the hills commonly do not keep track of dates and ages, and as a result different people give different dates for an event or different ages for the people involved. Wherever possible, KHRG has endeavoured to establish and indicate the most accurate dates and ages. Villagers sometimes mention 'last year'; this often refers to the period of time before the latest (June - October) wet season, rather than the previous calendar year, as well as using 'yesterday' to mean any time in the recent past. All numeric dates shown throughout this report are given in dd/mm/yy format. Toungoo District (known as Taw Oo in Karen) is the most northern of the seven Karen districts. It shares borders with Mandalay Division and Shan State to the north, Karenni State to the east, Pegu Division to the west, and Papun and Nyaunglebin Districts of Karen State to the so uth [see Map 2 of Karen State]. The westernmost stretches of the district lie within the fertile Sitta ung River basin which gives way to the hills known to the Karen as the Ka Ser Lu Mountains in the east. These rugged and heavily forested mountains cover the vast majority of the eastern portion of the district. The district is divided into two administrative zones: Than Daung township and Tantabin township. The boundary between the two townships roughly follows the route of the Toungoo to Mawchi motor road. The area to the north of this road is Than Daung township, while the area to the south is Tantabin townshi p [see Map 3 of Toungoo District] . Mo st of the inhabitants of Toungoo District are Karen, who traditionally live in small remote villages scattered over the steep hills. The State Peace and Development Council's (SPDC) attempts to gain complete control over the district have effectively divided the district into those villages which they have brought under their control, and those villages which the SPDC are not able to effectively control. The SPDC has dubbed the villages under its control as Nyein Chan Yay ('Peace') villages. The Nyein Chan Yay villagers must face regular demands for forced labour, building materials, extortion money, food and intelligence from SPDC military units and officials. Some of these Nyein Chan Yay villages are forced relocation sites where villagers are used as a ready pool of forced labour. Villagers living outside SPDC control are known as Ywa Bone ('Hiding') villagers. The SPDC considers these villagers to be aiding the resistance. Therefore it believes that to undermine the Karen National Union (KNU), it must carry out a war of attrition against the villagers. The villagers are hunted down and often shot on sight by SPDC Army columns. Their houses are burned down and their fields destroyed in an attempt to get them to come down and stay in SPDC-controlled villages. The SPDC's control is the strongest in the plains in the western part of the district. SPDC control is so strong that the Karen National Liberation Army (KNLA), the armed wing of the KNU, does not often venture into the area. Most of the activity of the KNU/KNLA is limited to the hills in the east. In order to extend its control into the mountains, the SPDC has been gradually increasing its presence by progressively establishing more camps farther afield in increasingly more remote locations. SPDC Army camps now dot the hills and patrols criss-cross the area, making few places free of their influence. The SPDC's Dam Byan Byaut Kya ('Guerrilla Retaliation Units') still operate in the district. A number of new Dam Byan Byaut Kya units have emerged and are now active in several areas that they were not previously operating in. The units do not appear to be killing as much as they once were, nor using the same brutal methods in which to do so. They seem to be more preoccupied with forcing the villagers to perform labour for them as well as demanding both food and money like the regular battalions. It appears that each of the battalions under the Southern Command based within the district have now formed its own Guerrilla Retaliation Unit. There are presently ten battalions from Southern Command and several more from the Western Command active in Toungoo District. There are also as many as seven separate Guerrilla Retaliation Units active in Toungoo District. The use of forced labour continues in the district despite SPDC pledges to put a stop to it. Villagers are ordered to carry rations and munitions to Army camps, particularly in the wet season when the demands for villagers increase because the roads have become impassable to vehicles. Many villagers are forced once a month to either go and porter, or hire itinerant labourers to go in their place. In some areas, the cost of hiring labourers has become so high that many villagers, already destitute, simply can no longer afford to do so. They then have no option other than to go and porter after all. The villagers are then unable to tend their own fields and plantations, leaving them with no source of income to pay forced labour fees or to buy extra rice, and driving many to the point of starvation. The forced labour fees, in addition to the full gamut of other fees and taxes extorted from the villagers, has further impoverished many villagers. The desire to avoid portering is not purely an economic one. The villagers are typically treated very poorly by the soldiers while portering, many of them are severely beaten when they cannot keep up, or collapse under heavy loads of up to 30 viss (49 kgs. / 108 lbs.). The danger of losing a leg or their lives to a landmine is also a concern very high in villagers' minds. SPDC soldiers regularly force villagers to walk ahead of them as human minesweepers so that they will detonate any landmines which may have been planted there. In some instances when villagers are ordered to carry supplies along the Bu Sah Kee or Mawchi roads, the soldiers do not accompany the porters as they carry their loads out of fear of the many landmines which have been laid in the region. 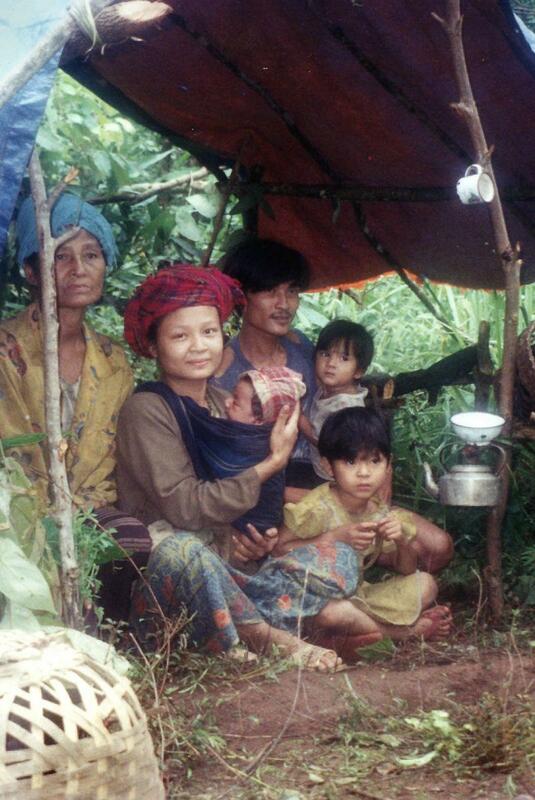 Both the SPDC and the KNLA continue to lay landmines, but it is the villagers who suffer the most from their use. In many areas across the district the SPDC has planted landmines deliberately targeting civilians. KHRG has received numerous accounts from villagers, stating that the SPDC has planted mines in their plantations, on the paths that they use when going to buy food, even in the villages themselves after the villagers have fled in advance of an approaching SPDC column. Food security has become a serious problem for almost all villagers in the hills. For those in the SPDC controlled areas, the forced labour and travel restrictions imposed upon them deny them enough time to go to their hill fields and plantations, leaving them short of food. The time granted to many villagers is often too short for them to be able to properly cultivate their fields. Some villagers are not even allowed to go to their fields. Regular demands for extortion money and forced labour fees rob them of any extra money with which to buy food. When villagers do have money to buy rice, the SPDC limits the amount that they are allowed to buy. For those living in hiding in the jungle, simply working their fields can be very dangerous as they are easy targets in their open hillside fields. The SPDC targets internally displaced villagers during the harvest season when they are far more visible in their fields. Having to constantly be on the run, needing to flee at a moment's notice also makes it extremely difficult for them to tend to a field. In order to get any food they must resort to planting small cash crops which they must carry to Nyein Chan Yay villages and sell in exchange for rice. By destroying their crops and shooting villagers in their fields, the SPDC is trying to starve the villagers out of the hills. Almost all of the 329 villagers interviewed for this report, whether they were in hiding in the forest or in SPDC controlled villages, stated that they did not have enough food. To further consolidate its control over the region, the SPDC has continued to push motor roads farther into the hills. The Kler Lah to Mawchi road, which the SPDC began constructing in 1999, has now been finished. The consequences of the completion of this road will likely mirror what happened further south after work was finished on the Bu Sah Kee car road. It will create an even greater military presence in the area due to the increased access provided by the road and the many new SPDC military camps that have been built along the road. The road will also make it much more difficult for villagers in Than Daung township to receive outside aid. The road, though completed, will need to be maintained and repaired each year after the rains cease and forced labour will undoubtedly be the means by which this will be carried out. The camps will need to be supplied, and it will again be the villagers who will have to porter the supplies. Most of the villagers interviewed by KHRG have stated that they simply wish to be left alone in peace to tend their fields and raise their families. The Karen struggle, now in its 55th year, has left most villagers exhausted. All but the oldest of villagers have seen nothing but war. For most villagers there are only two choices; remain in SPDC controlled areas where they must perform forced labour and comply with whatever demands are issued, or flee into the jungle where they must eke out an existence homeless, hungry, and hunted. The full report and appendixes are available in PDF form in the left-hand tab on this page.